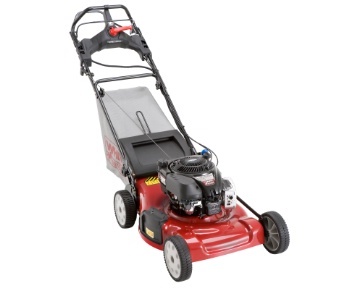 This Honda Lawn Mower HRC216HXA currently has a MSRP price of $1249, although dealers may offer a different price and specific models may have slightly different features. Check with your local dealer. The HRC216HXA model has a 21 inch wide deck with a rear bagger and mulcher combination. This machine is self propelled and comes with a hydrostatic commercial grade transmission system providing variable speeds to match your walking style or conditions as needed. Vary the speed from 1.8 to 4 miles per hour to deal with heavy grass, rough ground or transport situations. The hydrostatic transmission provides a lot of flexibility that many other lawn mowers just do not have. There are no belts to be concerned with as well since it is a shaft drive system. As with some of the other Honda lawn mowers, this one comes with the twin blade microcut system, which provides four cutting surfaces instead of the normal two cutting surfaces.. This Honda Lawn Mower comes equipped with the Honda Roto-Stop system which provides several unique advantages compared to other models. You can stop the blades from spinning without turning off the engine to move something out of the way or get around an object. Operators can also use this feature during transport from one area to another. Stop the blades from spinning while you use the self propelled feature to move the lawn mower from one cutting area to another! 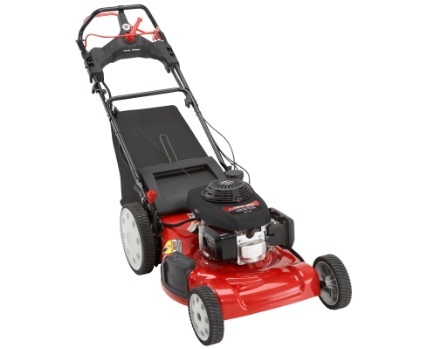 Other features that should be noted about this model of lawn mower from Honda include the front bumper that protects the lawn mower as well as objects you encounter in the lawn. It can also be used as a tied down location while being transported in a trailer or the bed of a truck. There are 8 mowing heights from 3/4 of an inch to 4 inches. The engine speed can be reduced to idle and the blades stopped while emptying the grass catcher bag. No need to shut the engine off and then restart it. Commercial operators will appreciate an added safety feature. There is a manual fuel shut off valve for added safety while the lawn mower is being transported. If you plan to not use the lawn mower over the winter for example, this valve can also be shut off and the fuel tank drained to prevent old gas issues from occurring. 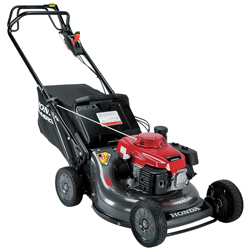 This Honda Lawn Mower model HRC216HXA can be used in residential or commercial situations and has many features that appeal to both environments and operators. Note that the warranty for a commercial operator is reduced to one year for everything except the engine which is two years. This is a short review showing the specifications only for the John Deere JS46. If you would like the full review, visit the original page by clicking here. This is a 22 inch wide machine suitable for most urban lawns used mainly by consumers. Professional lawn care contractors prefer wider machines to cut grass more quickly. This lawn mower is aimed at consumers who like the ease of use for starting as well as only needing to steer and let the lawn mower do all of the work. This lawn mower is 22 inches wide , self propelled from the rear and has a 3 in one deck – grass catcher, side discharge or mulching capability. A mulching lawn mower requires a lot less work in terms of either raking grass clippings or emptying the grass clippings our of the rear bag into a disposal bag of some kind. Refer to the main review page for additional comments by other readers as well. One of the features that almost everyone finds useful is the electric start capability. There is a pull cord, however for anyone that has difficulty starting in the manual way by pulling the chord, they will find that the push button start on this machine is very handy. Not everyone has the strength to pull the chord fast enough to start the engine, or perhaps there is some physical issue that prevents you from pulling the chord. Just push the button to start it , engage the drive and you are off to cutting your lawn. If you have a slope on your lawn, the rear wheel drive will make cutting this lawn very easy for most people. Cuttingt the lawn on a downwards cut it will be much easier even with a self propelled lawn mower. If you must climb the slope, the self propelled drive will make it a much easier task. The safest way to cut a lawn with a significant slope is to cut across the lawn to avoid slipping and being caught under the lawn mower and the spinning blades. Why not consider either a front wheel drive or a rear wheel drive lawn mower today. 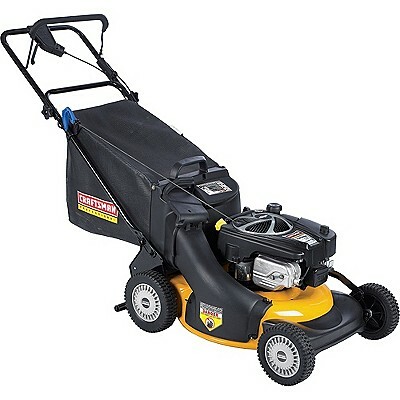 The Cub Cadet CC 550 SP Self Propelled Lawn Mower is one of the smaller lawn mowers at 19 inches is great for storing your lawn mower when not in use. You may take a bit longer cutting your lawn because of the smaller cutting width, but then it is easy to maneuver around lawn ornaments and landscaping than some of the larger machines. If you have a small garage or limited storage, a small lawn mower is much easier to deal with. The CC 550SP comes with lots of features, including a 173 cc engine, 3 in 1 convertible option and a 1.9 bushel rear bag grass catcher. You can catch the grass, mulch the grass or spread the grass clippings on your lawn using the side discharge. Easily convert from one to the other in seconds with no additional tools required. Of course the best feature is that it is self propelled. With the rear drive single speed propulsion system, you can make short work of your lawn and just steer as you are cutting the lawn. 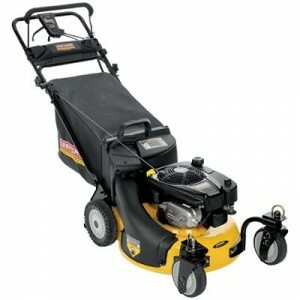 See our feature list for more features about this lawn mower. 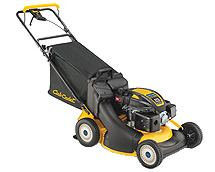 Warranty: This cub cadet 550sp lawn mower comes with a 3 year limited residential warranty. This Cub Cadet lawn mower also comes with an auto choke sure start guarantee. No need to set the choke, just pull the chord and away you go. The height of your lawn mower can be adjusted to one of 6 positions with a single leaver to accommodate your lawn condition. Most people will cut their lawn short when there is lots of rain, while leaving it longer during dry conditions to protect the roots from drying out. Shut the engine off before removing the rear bag to empty it of grass. Also shut the engine off when you are making any other kind of adjustments to the lawn mower. For more Cub Cadet information, click here. The Cub Cadet CC 550ES Self Propelled Lawn Mower is a 19 inch wide lawn mower, which is 2 inches smaller than the average lawn mower, however this makes it ideal for storage and getting around smaller places. It will take you a bit longer to cut your lawn, however the storage issue more than makes up for it. The Cub Cadet CC 550ES Self Propelled Lawn Mower comes with the normal 3 in 1 capability – mulch – rear bag – side discharge. Convert easily and quickly between modes depending on preference and cutting conditions. As with most lawn mowers you will find that longer grass is better bagged and disposed of vs. trying to mulch long grass. Short grass is much better for mulching. Depending on desired grass height, you can adjust the height of the cut from 1 inch to 3.5 inches using a single lever to adjust all four wheels. This lawn mower is also a rear wheel drive lawn mower with only a single speed set for the average walking speed. 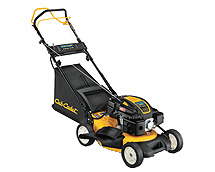 The Cub Cadet 550ES Lawn Mower is a great little lawn mower that will meet the needs of most consumers and even with the 2 inch smaller deck size you will find that storage is that much easier with this size of machine. Warranty: The CC 550ES Self Propelled Mower offers a 3-year limited residential warranty. This particular lawn mower also comes with an electric starter, so no need to pull the chord to start the engine. The rear wheel drive system on this lawn mower is only a single speed system and a little more difficult to control. with front wheel drive all you need to do to turn corners is left the front wheels slightly to disengage them from the ground to change directions. With rear wheel systems you must disengage the drive by letting the drive lever go and then turn the lawn mower on sharp corners. For slight corners, you can continue with the drive in operation and turn the corner in the normal mode. Shut the engine off before removing the rear bag to empty it of grass. Or making any other kind of adjustments to the lawn mower. 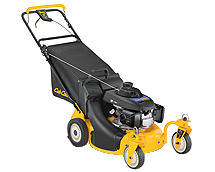 For more reviews of Cub Cadet lawn mowers, click here. The Cub Cadet CC 94 M Self Propelled Lawn Mower comes with a 173 cc engine equipped with an auto choke to enable starting every time without the need for adjustments.It is also a rear wheel drive machine with a variable speed control to allow you to match the speed to a comfortable walking speed. This is a three in one convertible lawn mower. Convert with out tools from a grass catcher to a mulcher to discharging the grass out the side of the lawn mower depending on preference as well as grass conditions. Longer grass will require either side discharge or grass catching mode. The auto choke sure start system allows operators to start the machine without the need to adjust the choke at any time. Starting is made much easier as a result. The tires have industrial tread on them for better traction with the self propelled rear drive. Great lawn mower for most residential lawns! 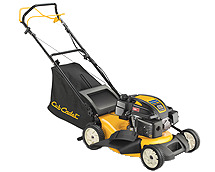 For more reviews on the Cub Cadet line of lawn mowers, click here. The Self Propelled Club Cadet 98 M Lawn Mower is a rear drive machine with variable speed control to match your own comfortable walking speed or to deal with rough terrain and obstacles that you want to take your time with. This lawn mower comes with a 173 cc engine and an autochoke sure start system to make starting the lawn mower engine easy every time. It has a 21 inch wide steel deck which is suitable for most residential lawns and consumers can set the cutting height from 1 inch to 3.5 inches with the single rear and 2 front adjustment controls. The wheels are 7 inch caster wheels on the front and 9 inch wheels on the back with industrial tread to give maximum traction. Operators can chose between using the rear bagger for collecting grass clippings to mulching the grass clippings as well as using the side discharge. Conversion is simple with no tools required. Note that the grass should be cut more often if you intend to mulch your grass. 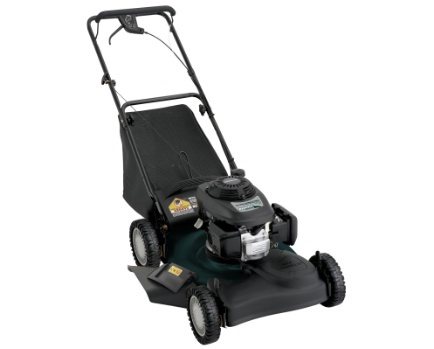 Warranty: This rear drive club cadet 98 M lawn mower comes with a 3 year residential warranty. This self propelled lawn mower comes with an auto choke which makes starting easy every time. It has a rear drive system that support variable speeds for the convenience of the operator. The front caster wheels make it easy for turning without having to raise the front wheels and missing an area of grass. 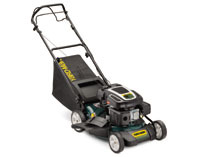 This is a great lawn mower that will work well for many consumers in residential situations. 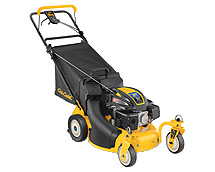 For more cub cadet reviews, click here. This Club Cadet Lawn Mower CC98H is self propelled with Cub Cadets SureSpeed rear wheel drive variable speed drive system. The engine is a 190 CC Honda OHV engine which is more than powerful enough to drive this lawn mower in any of the three modes that you choose to cut your lawn in. Consumers can switch back and forth with no tools required from a mulching lawnmower to a side discharge lawn mower or to a rear bag grass catcher. Select the mode that makes the most sense for your lawn and your personal preference for cutting lawns. Height adjustment is made with one adjustment on the rear wheels and one for each wheel on the front. Vary the height from one to 3.5 inches in height to cut your lawn to just the right height for local conditions. The front wheels are 7 inch caster wheels while the rear wheels are 9 inch fixed industrial tread wheels. The rear bag grass catcher holds 2.5 bushels of grass clippings and is easily detached for discharging cut grass. 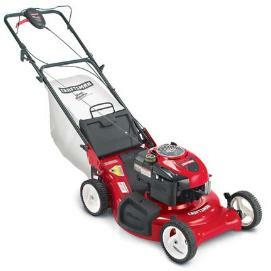 Engine: This Club Cadet Lawn Mower CC98H has a 190cc Honda® OHV engine. Propulsion: This rear wheel drive lawn more comes with a Cub Cadet SureSpeed™ rear-drive, variable speed drive. Warranty: This Club Cadet self propelled Lawn Mower CC98H offers a 3-year limited residential warranty. For more Club Cadet reviews, click here. The Club Cadet Lawn Mower 999 is self propelled from the rear wheels with 6 different speeds to chose from to match your walking speed, the local conditions and the thickness of the grass you are cutting. It comes with a powerful 173 cc engine equipped with an auto choke which is part of their Surestart guarantee. The width of the cut is 21 inches and the front wheels are swivel type to make turning very easy while in rear wheel drive mode. At 21 inches wide most consumers will find this lawn more than adequate for cutting and trimming most suburban lawns. The front caster wheels make this lawn mower very navigable for consumers cutting around landscaping and other items that may be in your lawn. Consumers can chose between mulching your grass, ejecting the grass clippings through the side discharge or capturing the grass clippings in the rear bag attached to the lawn mower. It also comes with a single lever height adjustment for cutting the grass at the desired height. Warranty: The CC 999 Self Propelled Mower offers a 3-year limited residential warranty. The cutting height can be adjusted from one inch to 3.5 inches. The tires have industrial tread on them with the front wheels being 7 inch caster type and the rear wheels at 9 inches in size. If you decide to bag your grass clippings with the rear bag grass catcher, the bag contains 2.5 bushels of grass capacity. For more cub cadet reviews and information, click here. The Bolens Self propelled lawn mower is full featured with almost everything most urban consumers will need for cutting their lawn. The twenty one inch wide deck is plenty wide enough for most home owners to cut an average lawn. There are wider lawn mowers, however for most people this lawn mower will be fine. It is rear wheel drive with four speeds so this takes getting used to. Personally I like the front wheel drive machines, since I can keep the drive engaged and just lift the front wheels a bit to slow it down or turn while disengaging the wheels from the ground. For those of you who like the option you can choose between mulching your lawn, discharging it along from the side or just spreading the clippings across your lawn. This is a versatile machine which most home owners will enjoy using while trimming their lawns. The Bolens V469Q model self propelled lawn mower comes with a bottle of oil. All you have to do is add the oil, add gasoline to the fuel tank, secure the handle and you are ready to go. You will probably need to adjust the height of the cut to your needs with the single lever adjustment for all wheels. This is an ergonomic well constructed machine which should last you many years. For more reviews of rear self powered lawn mowers like this one, click here. The Yardman 173CC 21 3 in 1 High Rear Wheel Push Mower has a high rear wheel providing greater leverage to support the 2.3 bushel bag at the rear to catch grass clippings. Convert from a rear bagger to a mulcher to a side discharge lawn mower in seconds. You can cut your lawn the way you want without having to invest in expensive attachments. The auto choke feature also makes this lawn mower much easier to start. No need to fuss over the choke and flood the engine. It is all automatic and will start every time. This push lawn mower also comes with a 9 position height adjustment system that lets you cut your to the exact specifications of a golf course if you prefer. Delivery: Most lawn mowers can be picked up in the store, however if you do not have the means to take it home yourself, delivery usually can be arranged for a delivery charge. You may want to consider borrowing a trailer or a van to bring home your lawn mower and avoid the delivery charge. The Yardman 173CC 21″ 3-in-1 High Rear Wheel Push Mower can be purchased at Menards. Maintenance of the Yardman 173CC 21 3 in 1 High Rear Wheel Push Mower lawn mower is pretty straight forward. Read the guidelines in the manual and follow them. Arrange to have your engine tuned up once a year and the oil changed at the same time. This applies to most consumer applications where you are cutting your lawn once a week. If you are using the lawn mower for commercial applications you may need to change the oil more often. The Yardman 173CC 19″ RWD Self-Propelled 3-in-1 Mower, although smaller than some machines at 19 inches, is still a lawn mower that will appeal to many people with its rear wheel drive system and 3 in one lawn mower capabilities. There is a 6 position height adjustment for operators to adjust the cutting height to exactly the desired length of lawn. In addition this lawn mower also is a 3 in 1 mower with the capability to mulch the grass, collect the grass clippings in a 2.3 bushel bag in the rear or to discharge the grass clippings out the side of the deck. The Yardman 173CC 19″ RWD Self-Propelled 3-in-1 Mower although self propelled from the rear is a single speed system, so you cannot match the speed to your personal walking style. The engine comes with an auto choke making it easy to start as well as maintain. This is an excellent lawn mower for those who do not want to push their lawn mowers, but still need sufficient power and features to maintain their lawns. Delivery: Most lawn mowers can be picked up in the store, however if you do not have the means to take it home yourself, delivery usually can be arranged for a delivery charge. You may want to consider borrowing a trailer or a van to bring home your lawn mower and avoid the delivery charge. This lawn mower can be purchased at Sears. The John Deere self propelled Lawn Mower JS46 comes with a 190 cc Briggs and Stratton engine, the work horse of the small engine industry. The engine is equipped with zone start recoil rope starting system which is one of the many safety features on this self propelled lawn mower. Operators must stand behind the lawn mower with the zone lever depressed to start the engine. If the zone lever is released the engine will automatically stop. This protects the operator from accidentally getting in the way of the cutting blades of the lawn mower. The carburetor is designed to start without the need for priming or choking. A fresh start fuel cap can be filled with fuel stabilizer to ensure that the gasoline is always fresh for easier starting and smoother running. The engine uses a dependable splash lubrication system to protect all engines parts from wear. The engine meets all CARB emission requirements. The pivoting handle controls how fast the self propelled lawn mower will go based on the angle of the handle. The speed varies from zero to 4.6 miles per hour. If you prefer a constant speed you can also lock in the speed with a a drive lock key, located on the MowMentum drive handle. The 22 inch steel deck comes with a 3 in one blade allowing the operator to chose between mulching, side discharge or rear bagging. The side discharge on the John Deere self propelled Lawn Mower JS46 is easy to install. Just flip up the cover on the side of the deck to install the deflector and distribute the grass on the lawn. Change from one mode to another without tools. The rear bag grass catcher holds 2.5 bushels and attaches easily at the back of the self propelled lawn mower. Adjust one lever to adjust all wheels . Choose from cut heights from 1.2 inches to 4.2 inches. If you plan on mulching, the longer the grass the better since it conceals cut grass until it degrades and returns the nutrients to the lawn. John Deere feels that a cut height of 3 to 4 inches is the best height for mulching. The handle bar is wide for comfort. Depress the zone control lever to start the engine and for continuous running. The handle bar also has 3 height adjustments to match your comfort level. Adjust the height without tools. Fold the handle down for compact storage and also for transport in your vehicle or trailer. The price of the John Deere self propelled Lawn Mower JS46 was $499 US at the time of this review. Delivery: The John Deere self propelled Lawn Mower JS46 can be purchased at John Deere dealers through the US and customers can arrange for in store pickup or they can arrange for delivery. Delivery will be at an extra charge and customers may want to make alternate arrangements for delivery. Operation of the John Deere self propelled Lawn Mower JS46 is pretty straight forward. Always start the engine using the zone control and never circumvent this control to prevent accidents. This is one of the most significant safety additions to lawn mowers to prevent unneeded accidents. Read the manual before you operate the John Deere self propelled Lawn Mower JS46 for the first time to become familiar with all of the controls and general operation. Check the oil each time you use the mower and top up if needed. Fill the fuel tank while the engine is cold . Wait until it has evaporated before you start the engine to avoid the possibility of fire. Clean off the deck on the upper side as well as the lower side to remove any debris and grass clippings. A clean deck will ensure that your deck lasts for many years and does not corrode over time. Maintenance of the John Deere self propelled Lawn Mower JS46 consists of changing the oil at regular intervals, following the guidelines in the manual. Keep the deck clean at all times, and arrange to sharpen the blade at least once per year. The John Deere self propelled Lawn Mower JS36 comes with a 190 cc Briggs and Stratton engine, the work horse of the small engine industry. The engine is equipped with zone start recoil rope starting system which is one of the many safety features on this self propelled lawn mower. Operators must be standing behind the lawn mower with the zone lever depressed in order to start the engine. The engine automatically stops when the zone lever is released. This safety measure prevents the operator from accidentally getting in the way of the cutting blades of the lawn mower. The carburetor starts without the need for priming or choking. Fill the fresh start fuel cap with fuel stabilizer. Therefore the gasoline is always fresh for easier starting and smoother running. The engine meets all California Air Resources Board ( CARB) requirements. The engine also uses a dependable splash lubrication system to protect all of the engines parts from wear. The momentum drive system is an excellent feature of the John Deere self propelled Lawn Mower JS36. The pivoting handle controls how fast the self propelled lawn mower will go based on the angle of the handle. The speed varies from zero to 3.8 miles per hour. If you prefer a constant speed you can also lock in the speed with a a drive lock key, located on the MowMentum drive handle. The 22 inch steel deck comes with a 3 in one blade allowing the operator to chose between mulching, side discharge or rear bagging. The rear bag, the mulch cover and the side discharge deflector are all standard. The 22 inch deck is stamped from 14 gauge steel. The side discharge on the John Deere self propelled Lawn Mower JS36 is esy to install. Just flip up the cover on the side of the deck to install the deflector and distribute the grass on the lawn. Projectiles are prevented by the deflector from being flung distance from the lawn mower. Change from one mode to another in minutes without tools. The rear bag grass catcher holds 2.5 bushels and attaches easily at the back of the self propelled lawn mower. Adjust the height of the cut easily by adjusting one lever to adjust all wheels . Choose from cut heights from 1.2 inches to 4.2 inches. If you plan on mulching, the longer the grass the better since it conceals cut grass until it degrades and returns the nutrients to the lawn. John Deere feels that a cut height of 3 to 4 inches is the best height for mulching. The handle bar is wide for comfort. Depress the Zone control lever for starting and continuous running. The engine speed runs at 3350 rpm to ensure smooth operation. The handle bar also has 3 height adjustments to match your comfort level. Adjust the height without tools. Fold the handle down for compact storage and also for transport in your vehicle or trailer. The price of the John Deere self propelled Lawn Mower JS36 was $399 US at the time of this review. Delivery: Consumers purchase the John Deere self propelled Lawn Mower JS36 at John Deere dealers throughout the US . Customers can arrange for in store pickup or they can arrange for delivery. Delivery will be at an extra charge and customers may want to make alternate arrangements for delivery. Operation of the John Deere self propelled Lawn Mower JS36 is pretty straight forward. Always start the engine using the zone control and never circumvent this control to prevent accidents. This is one of the most significant safety additions to lawn mowers to prevent unneeded accidents. Read the manual before you operate the John Deere self propelled Lawn Mower JS36 for the first time to become familiar with all of the controls and general operation. Check the oil each time you use the mower and top up if needed. Fill the fuel tank while the engine is cold. Wait until it has evaporated before you start the engine to avoid the possibility of fire. After finishing for the day, clean off the deck on the upper and lower side removing any debris and grass clippings. A clean deck will ensure that your deck lasts for many years and does not corrode over time. Maintenance of the John Deere self propelled Lawn Mower JS36 consists of changing the oil at regular intervals. Always follow the guidelines in the manual. Keep the deck clean at all times, and arrange to sharpen the blade at least once per year. The White Lawn Mower J836L is a great little lawn mower with lots of features that many consumers will enjoy. It is one of the easiest to use around the yard and the most versatile and flexible as well. Starting with the 160CC Briggs & Stratton engine which has been engineered to be quieter and cleaner burning than past models. It employs a Direct Overhead Valve engine or DOV with a ready start technology to give you outstanding power and torque. The White Lawn Mower J836L also has a self propelled capability with a 4 speed transmission. Now consumers can just follow along with the lawn mower at a speed that is comfortable for them . If you would like to maintain the self propelled capability, but slow down a bit around landscaped ares, just down shift to a slower speed. 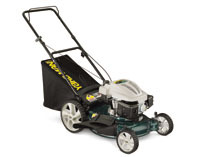 With a 21 inch mulching deck, this lawn mower can make short work of any lawn. Consumers can bag their grass with the rear bagger, mulch their lawns or just discharge the grass clippings to the side. Many consumers prefer to leave the grass clippings on the lawn to return many of the nutrients that are available in the grass using the mulching system or the side discharge. Of course you can easily switch to rear bag the grass if it gets too long between cuttings. The White Lawn Mower J836L also comes with an electric starter. No more pulling the chord to start the lawn mower , just press the button and your ready to go. This lawn mower comes partially pre-assembled. Consumers will need to unfold the handles and add oil to the engine, prior to starting the lawn mower for the first time. This is a really important point, so do not forget to add the oil to avoid significant damage to the engine. In fact in our safety and operation section we urge consumers to always check the oil each time before they start the engine at the beginning of the day. Adjust your cutting height to one of several positions with the single lever height adjustment capability. The handles will fold for easy storage and fitting into those tight places. White has added new handles which are supposed to be more comfortable and ergonomic. Delivery: Consumers can purchase the White Lawn Mower J836L at a number of dealers including Reno Depot and also at Rona. Most consumers will pick up the White Lawn Mower J836L at the dealer. Delivery is an option, however you should expect to pay a delivery charge. Consumers should always read the manual before operating the White Lawn Mower J836L for the first time. Review all of the operating procedures and also the safety guidelines. It is important to follow safe operating guidelines. It only takes a few minutes to be safe vs. an accident which could have results that last a lifetime. Before starting the engine each time, always do a quick check of the machine to verify that everything is in working order. Always check the oil in the engine of the White Lawn Mower J836L and top up if needed. Sometimes there can be unknown leaks and your engine oil may be low. When operating the lawn mower and using the side discharge , always avoid allowing the discharge to point towards another individual. Or towards a car for example. Some times sticks or even stones can be picked up and kicked at high speed out of the discharge chute. These projectiles can achieve a high rate of speed and if they hit a person or an object can cause a lot of damage. The self propelled lawn mower can travel at one of 4 speeds. Slow down around landscaped areas of tight spaces. You may even want to disengage the drive system while you are mowing grass around landscaped areas. Each time you operate the lawn mower, fill up the fuel tank to avoid running out and having to refill while the engine is hot. If you spill gasoline while filling the lawn mowers fuel tank, wait until the gasoline has evaporated before starting the engine. Maintenance of the White Lawn Mower J836L is fairly straight forward. Always check the oil before starting. If it appears to be black in color, change the engine oil immediately. Change the oil at a minimum of once per year and if you are a heavy user with a lot of lawn to cut you may need to change the oil more often. The Troy-Bilt Self Propelled Lawn Mower J863Q is a self propelled lawn mower with 4 speeds to match your walking speed and the thickness of the grass you are cutting. Chose between mulch, side discharge or catch the grass clippings in the rear bag that comes with the lawn mower. This is a rear wheel drive which is where the weight is and it provides better traction as a result. The large wheels make this machine easy to maneuver and provides the right weight balance regardless of whether the grass catcher is full or not. Combined with an electric start engine, this self propelled lawn mower will make your lawn cutting experience enjoyable. The ergonomic handle reduces fatigue and provides single handed use, while the other hand is controlling the speed or just taking a rest. 160 cc Honda OHC engine with overhead cam, 4 cycle. The Troy Bilt self propelled lawn mower J863Q comes pre-assembled and all you need to do is pour the bottle of oil into the engine to the desired level, add fuel to the fuel tank and you are ready to go. Customers should always complete a full check of the lawn mower on their very first use to confirm that all elements are working properly and that there are no problems with the lawn mower. The engine is a 4 cycle engine, engineered and certified for low emissions. The engine is also a low noise engine and since it is a 4 cycle engine, you do not have to mix oil and gasoline. Delivery: Consumers can purchase the Troy-Bilt Self Propelled Lawn Mower J863Q at Canadian Tire stores across Canada. You will need to make your own arrangements for pickup if you cannot fit the lawn mower into your car. Practicing good safety with your lawn mower is much the same with any piece of equipment. Read the manual and familiarize your self with all of the safety procedures prior to starting the engine. Always check the lawn mower over prior to starting it at any time. Confirm that there is sufficient oil in the engine. Top up if needed. Check the fuel level as well and top up while the engine is cool to avoid any possibility of a flare up. If you spill fuel on the engine or the housing wait until it has full evaporated prior to starting the engine. Never point the discharge at other people, buildings or cars. Projectiles from the side discharge can be at a high speed and cause accidents if you are not careful. Always shut the engine off before making any adjustments and prior to removing the grass catcher to empty it. This is an excellent habit to get into to avoid any possibility of an accident. If you must clean out the underside of the deck, remove the key so that the Troy Bilt self propelled lawn mower J863Q cannot be accidentally started. Again, check the manual for all recommended maintenance requirements of the Troy Bilt self propelled lawn mower J863Q. After every use always clean off the deck to clear it of any grass , dirt and grime to avoid prematurely causing corrosion of the deck. Clean any clumps off the underside as well. These clumps will dry over time and fall off on your driveway or in your garage leaving a mess. Also change the engine oil at recommended intervals. Depending on use, you may need to change the oil often if you have a large lawn to cut. At a minimum, change the oil at least once per year to protect the engine and extend the overall engine life. Anytime you notice items needing repair, repair them immediately to avoid causing further damage to the lawn mower.